The world is bigger than Stockholm, Gothenburg and Sweden and chances are that you live in a completely different part of the world! 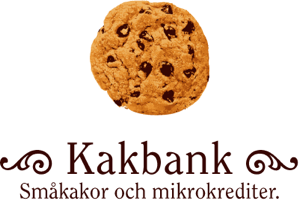 But don't despair - before you can say "Swedish sugar cake", you'll have your own Kakbank! 1. Email Peter (peter at kakbank dot se). I'll be happy to help out with practical issues and general rooting for you! 2. Send a letter to all your friends. Explain the idea and set a date for your first Cookie Bank. Everyone loves cookies, so getting people to come is rarely a problem! 3. Register an account with Kiva. It's free. Why not call it Kakbank and the name of your town, like "Kakbank NY"? And as a bonus - join the Kakbanks-team, so you can see the joint impact we have! 4. Through Kiva you can find projects from around the world who want to borrow money for a short period - so-called microcredit. When the loan term is up, you'll money will be paid back (but it can happen that it's not paid back, so be clear that the money people give to your Kakbank is a donation). Kiva is legit. 6. On the big night, you collect eg $10 from those who want to participate. If you prefer, people can transfer money to your bank account in advance. 7. Discuss the current the projects at Kiva and decide which ones you like the most and how to lend to each project. Make sure that the cost of the loan ("Portfolio Yield") for the recipient is reasonable (too high cost means that recipient will have problems repaying the loan and too low will mean that the local bank wouldn't be sustainable). Transfer your money to Kiva through you credit card. Enjoy the cookies! 9. Congratulations you are a bank manager! This what I have with my Kakbank, but find something that works for you! Does it seems complicated? It is easy. Honestly. And I am always available for questions, so email me - peter at kakbank dot se!